Managing webmail can prove to be a challenge in our busy society. We are often bombarded with impersonal messages that are the result of being an address on a large distribution list or the target of a marketing campaign. What can be done to manage the sheer volume of incoming webmail we receive? Webmail Filters are the perfect solution for managing our incoming and outgoing mail. Fortunately, setting up webmail filters is a fairly simple process. 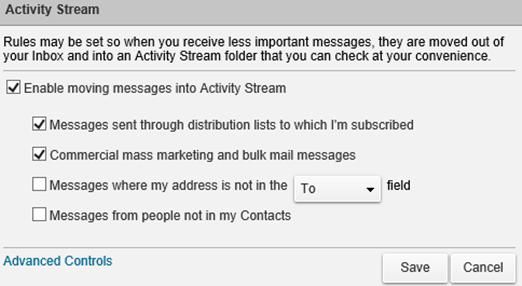 By capitalizing on the intuitive and efficient nature of our webmail service, you can easily set up filters to manage incoming and outgoing email messages, including calendar-related messages and Activity Streams. A filter consists of one or more conditions and one or more actions. You can base a condition on a subject, email messages from a specific person, or messages for a particular date. If the message matches the conditions, a specified action of your choosing is performed. Sort incoming messages into folders. For example, all email messages from a particular individual are automatically moved into a specified folder upon receipt. Tag messages. Email messages regarding a particular event are marked with the 'Events' tag, for example. Forward or discard email. For example, all email messages received from a particular email address are moved to the Trash folder. Please Note: Filters are applied in the order that they are listed. You can change the order at any time. We have included step-by-step instructions below on tackling the most common webmail filtering features. Please see Most Common Filtering Tasks listed directly to the right. Click on a feature description (e.g., Apply a Filter to Email Messages) and it will allow you to jump to specific instructions below. Then, click the browser back button to return to the top of the page. Ready to get started by creating a Filter? Step 1. Select Preferences from the top menu bar. Then select Filters from the drop-down menu that appears. Step 9. Enter or select the information to compare against, such as the date, email address, or phrase. Conditions are not case-sensitive. Step 10. To add more conditions, click the + button and repeat the above steps. The order of the conditions does not matter. Step 11. Under Perform the following actions, choose an action from the drop-down menu, such as Move into folder. Depending on the action that you choose, you might need to browse to locate a folder or tag name, or enter an email address to redirect a message. Step 12. To add more actions, click the + button and repeat the above step. The actions are applied in the order in which they are listed. Please Note: An email message is evaluated by each active filter, unless you specify that a message is treated only by the first filter that it matches. Usually, you do not want more than one filter applied to a message after the first match because the message can undergo multiple, perhaps contradictory, actions. 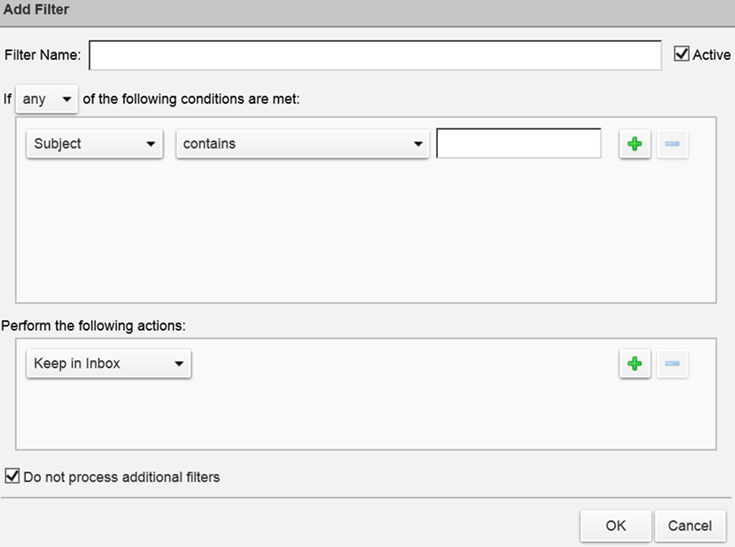 Once the filter information is extracted from the message, you can modify the conditions and actions. Using a filter is a quick way to organize email by moving messages into folders. Step 4. Click OK. A Filter run complete message displays when finished. Step 6. Click OK. The Activity Stream filter displays in your Active Filters list.